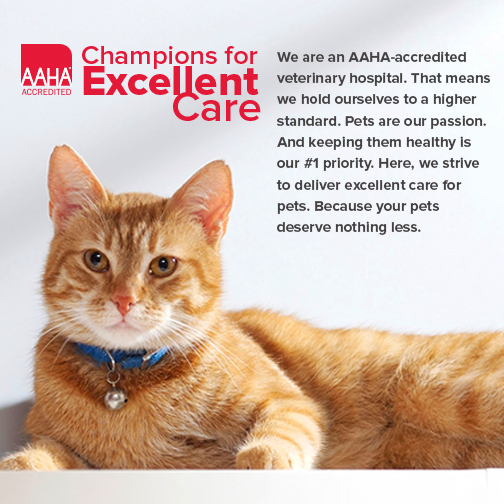 Only the top 12% of animal hospitals in the United States earn accreditation by the American Animal Hospital Association (AAHA). Did you know that unlike human hospitals, accreditation is not required by law? So the majority of animal hospitals choose to avoid this rigorous outside evaluation. The Montgomery Animal Hospital has been evaluated by this independent organization every 3 years - and has earned continuous accreditation since 1950! We are assessed on safety protocols, medical equipment, veterinary knowledge, and every key area of pet health care. Infection control: we installed extra ventilation in our exam rooms so we can change out all the air within minutes. That means that your pet won't catch a contagious cough from a previous sick patient. Patient care: if your pet is sick or undergoing surgery in our hospital he or she will be closely monitored every step of the way. Pain control is a priority and treatment is tailored to the specific needs of each pet. Knowledgeable veterinarians: our veterinarians pursue twice the amount of continuing education required by the state board to maintain their veterinary licenses. You have picked a hospital for your pets that will deliver consistent expert care from the entire team in a modern facility - and you're not just taking our word for it.